1. In a 3-quart saucepan, over high heat, place neck, heart, gizzard, vegetables and salt in enough cold water to cover. Heat to boiling. Reduce heat to low; cover and simmer 45 minutes. 2. Add liver and cook 15 minutes longer. Strain broth into a large bowl; cover and reserve broth in the refrigerator. 3. To make the gravy, remove the cooked turkey and roasting rack from the roasting pan. Pour poultry drippings through a sieve into a 4-cup measuring cup. 4. Add 1 cup giblet broth to the roasting pan and stir until the crusty brown bits are loosened; pour the deglazed liquid/broth into the cup with drippings. Let the mixture stand a few minutes, until the fat rises to the top. 5. Over medium heat, spoon 3 tablespoons fat from the poultry drippings into a 2-quart saucepan. Whisk flour and salt into the heated fat and continue to cook and stir until the flour turns golden. 6. Meanwhile, skim and discard any fat that remains on top of the poultry drippings. Add remaining broth and enough water to the poultry drippings to equal 3-1/2 cups. 7. Gradually whisk in warm poultry dripping/broth mixture. 8. Melt the butter in a large skillet over high heat. Add the mushrooms and saute until the mushrooms are tender and all liquid has evaporated, about 3 to 4 minutes. 9. Stir mushrooms into hot gravy. Season with salt and pepper and cook and stir until gravy simmers and is slightly thick. 10. 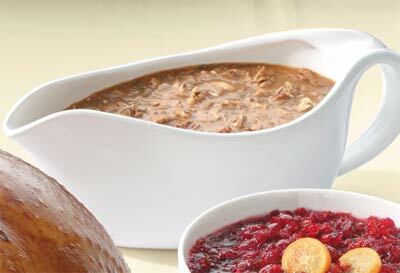 Serve hot in a warm gravy boat.